The Microsoft Dynamics 365 CRM default value for the maximum number of activated business process flows is 10 per entity as referenced in this MSDN link. This 10 per entity count applies to the Primary Entity associated with the activated Business Process Flow (BPF). The same entity that are part of other BPF but not the primary DOES NOT include in this count. Example: Out of the box “Lead to Opportunity Sales Process” consists of both the Lead and spans to the Opportunity entity. The BPF’s primary entity is Lead – so the other entity “Opportunity” does not count toward the 10 active Opportunity BPF maximum count. You can specify a different value by using the Organization.MaximumActiveBusinessProcessFlowsAllowedPerEntity attribute. However, if the value is greater than 10, you may see a decrease in your system’s performance when you switch processes or open a record that has an assigned business process flow. This may be especially noticeable if processes span multiple entities. We could use SQL Server Management Studio to directly access the Microsoft CRM On Premises CRM Database Organization table to view and update the max value. Or use the Dynamics CRM Organization Settings Editor (OrgDBOrgSettings) CodePlex solution that works on both Dynamics 365 Online or On Premises. More than 10 ACTIVE BPFs of the same primary entity! Contact me if you need some Microsoft Dynamics 365 CRM/Sales assistance. Workopia, Inc – Maximum User Adoption! 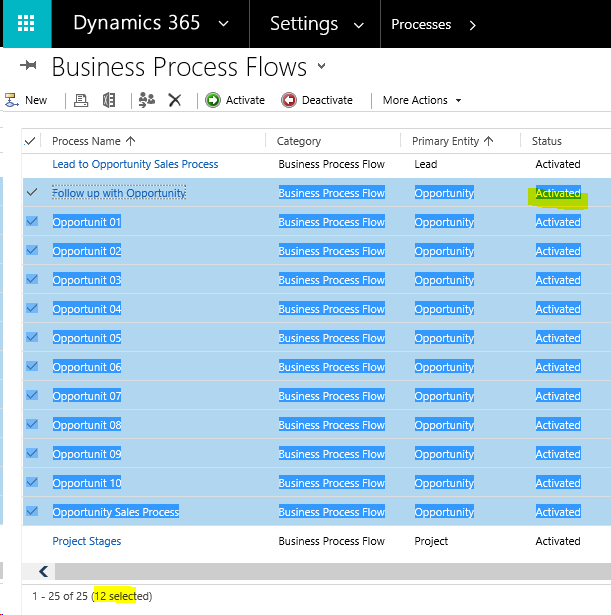 This entry was posted in Business Process Flow, CRM On Premise, CRM Online, Dynamics 365, Microsoft CRM, Microsoft Dynamics CRM, MS CRM and tagged Too many active business process flows. Bookmark the permalink.